Dogs are the best, as they're always eager to help, even though they have absolutely no idea how to do so in almost every scenario known to man. It's still pretty great because it means that dogs are down for literally almost anything one hundred percent of the time. After all, if you told any other person who trusted you completely to simply get in your car every single day without telling them where you were going or why, it's very unlikely that you'd never be questioned about either the destination or the reason why they're making the trip. It's no different than when they make their way into your workplace while you're trying to get things done. Hammering a nail that needs to go into a board? The young woofer will bark at that nail until it's flattened in place. Drop your plate at the lunch table? You can bet that your dog will be there to lap every last bit of it up and make sure you aren't causing the custodian any additional grief by leaving a mess after a half-hearted attempt at cleaning it up with a paper towel or napkins is wrapped up, leaving behind whatever oils, residue, and tiny food bits that the paper wasn't able to scoop up. 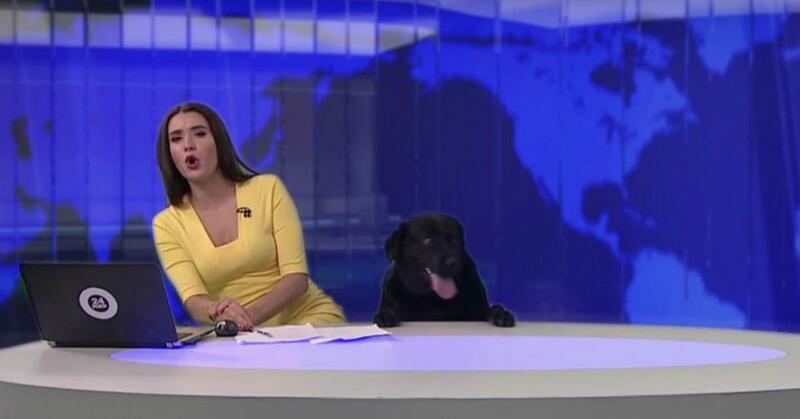 THIS JUST IN: A dog decided that there was a severe lack of pup-ness on Russian news station MIR 24, so they gave a reporter a helping paw during a live broadcast. The dog quickly became a viral star, interrupting TV anchor Linarte's presentation by jumping up on the desk and sniffing at her notes. Probably his way of checking the facts? I don't know much about dog journalism, so I can only guess. The little pupper seemed ecstatic to be on air while Linarte did a pretty good job of keeping it together. Linarte gave the adorable pupper a quick pet before ultimately revealing that she was a cat lady. "I actually prefer cats," she said to the audience in Russian. No word on how this made the dog feel. News.com.au reports that the dog was part of another segment and somehow got loose in the studio before making his appearance live. Once Twitter got hold of the incident, obviously, everyone was ecstatic that the cute black lab got his shot at finally becoming a co-anchor. @colinjones That's a news source I would trust. "Today's top story: Cats. Are they really your friend?"